Although I have not had the pleasure yet of reading any of author Ronie Kendig's books, I have heard a lot of good things about them! 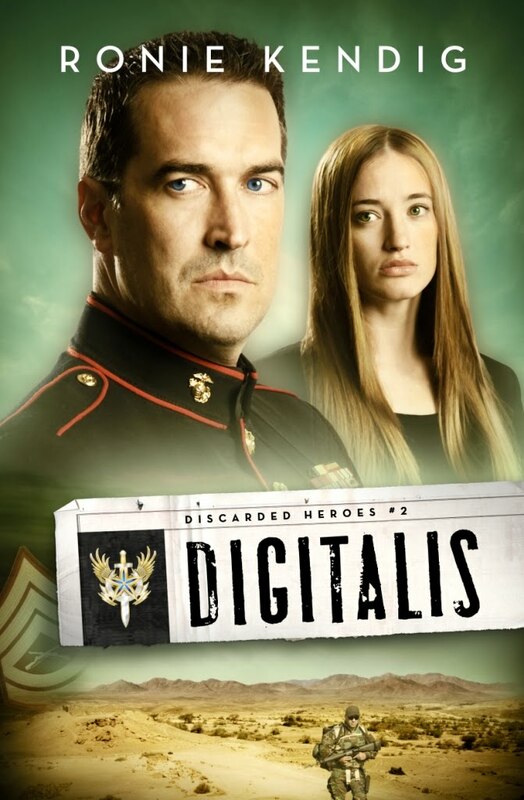 Ronie writes Christian fiction and has had two books published in a military suspense series entitled "The Discarded Heroes" (Nightshade and Digitalis). Please give a warm welcome to Ronie Kendig! Amber: Thank you so much for joining us today, Ronie! To start, could you share a little bit about yourself? Ronie: Thanks so much for having me, Amber! I’m delighted to visit with y’all. About me? Well, I have been married for twenty years (yes, to the same man LOL) to my hero, an Army veteran, and we have four children, ranging in age from 17 to 11. I was born in Germany to American military parents, and experienced the typical Army brat life—including attending five schools in four years. Oy! 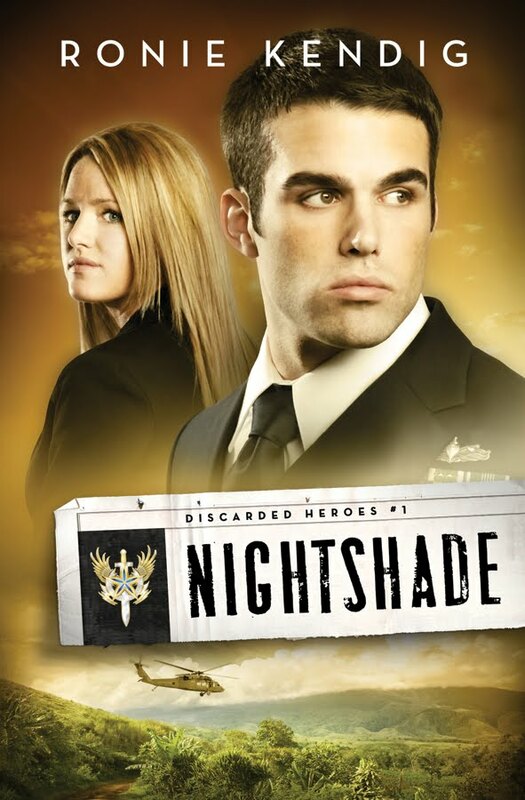 Amber: What inspired you to write a military suspense series? Ronie: As you can probably guess, my upbringing. I was always around the military and had a tremendous respect for them. My husband’s father is also retired military, so I’ve just been around it pretty much my whole life. When I started reading articles about our soldiers coming home with issues, the idea took hold. Amber: What do you admire most about the military? Ronie: I truly believe that God places within our troops a “warrior” spirit. Just as some people are called to be pastors, some teachers, some writers (*grins*), I believe some are called to live a warrior’s life. It’s not an easy one, it’s often not fun, but it’s a part of them. They are our defenders, our front lines literally, and I have a strong awareness that because of their sacrifices, I am free and living in a free country. They’re away from their families for extended periods of time, facing things I cannot even imagine. Amber: As an acclaimed publish author, is there anything you have learned about humility that you can share with us? Amber: What’s next in your writing career? 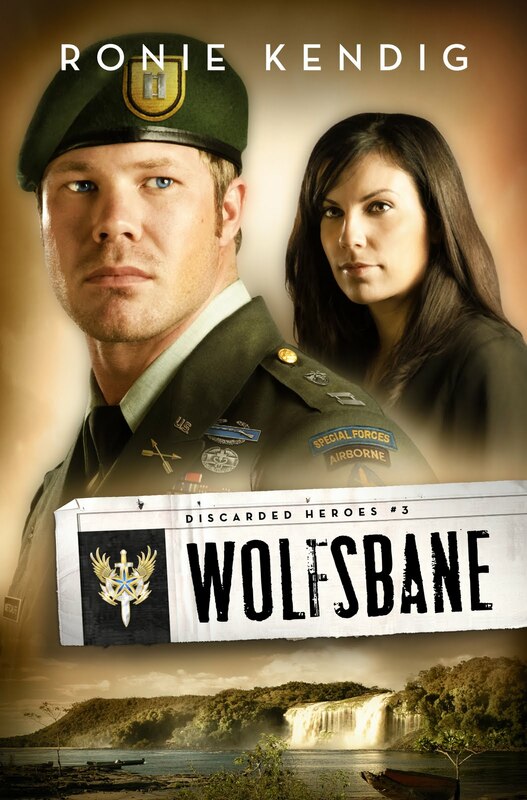 Ronie: I have just finished the line edits on Wolfsbane, Discarded Heroes #3, and I’m already about ¼ of the way through Firethorn, book #4. I also have a novella for a collection with three other authors that will release next April, and I’ve just signed a 3-book deal with my publisher for a series on retired military war dogs and their handlers. I am extremely grateful to the Lord for letting me do what I love—write! Amber: Wow! Congratulations on signing that contract and having so many new projects to work on! So, how can we pray for you and other authors? Ronie: I would appreciate prayers that I ever stay humble in heart because the day I look to myself and others more than the Lord is that I am miserable and failing. Some days, this is very easy (to stay humble), and other days, I can feel the ego inflating. Amber: Thank you again for joining us, Ronie! It's been wonderful getting to know you. 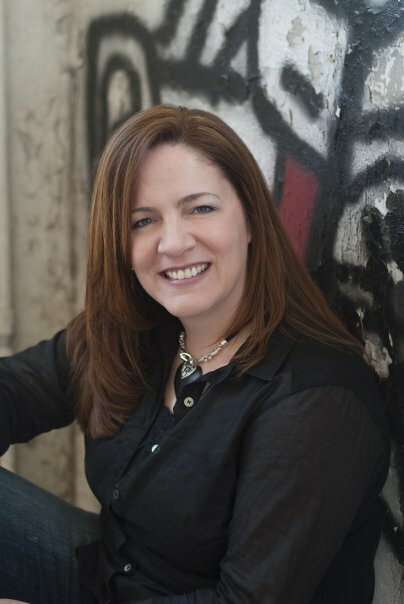 Readers, you can find out more about Ronie and her books by checking out her website HERE! We want to know why disasters happen. We want to know why one person seems to suffer so much more than someone else. We want to know why God causes us pain. I am reminded of the viking Stoick in the movie How to Train Your Dragon. He wanted so desperately to find the dragons' nest--the place where all the dragons returned to with their food (the vikings' sheep, the fish, etc.). In his quest to find the dragons' nest, he lost many of the village's ships (and most likely many human lives, as well). He always got lost and turned around, and his missions failed. But still, he fixated on the goal of finding that nest. Stoick didn't understand the dragons. He didn't know what he was getting into by trying to find the nest. 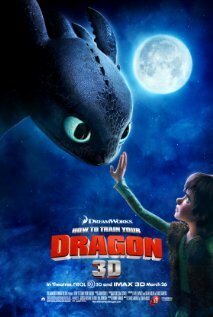 But his son, Hiccup, realized that the dragons are far different than what they had seemed. In fact, some of them made wonderful friends. And he eventually discovered the nest because only a dragon could find it. When his son inadvertently shared this information, Stoick forced Hiccup's dragon to lead him to the nest--an island with a dragon larger and more dangerous than they could ever have imagined (the "queen" of the "hive"). It is only with the help of other dragons that they had any hope of victory. Now, in regards to knowing why God does what He does, I am not saying that we can manipulate Him to help us find the answer. And I am not saying that the answer is horrible and dangerous. From our earthly perspective, the answer seems like it really must be terrifying, more so than some gigantic dragon that can stomp ships, fly, and breathe fire. For how could such a loving God let us suffer in seemingly unnecessary ways? But the truth is, that is just our perspective. I do not wish to seem callous and say that you should never ponder why God is allowing you to suffer and grieve. In fact, I believe with all my heart that we should speak honestly to God, as the authors of the Psalms did. We can tell Him how we perceive things to be; He cares and knows how much we are hurting. But realize that the "dragons" that seem so repulsive to you may not really be what they appear to be. Only God can see the whole lay of the land from His perspective far above. We are "earth-bound" and in no position to see how everything fits together. Sometimes we get glimpses. Like riding on a dragon friend, we get an opportunity to fly above and look back, seeing just a small part of how God is working in our lives. Those moments--when we realize that a certain pain-filled path led us to an amazing place--are gentle reminders to our tender hearts that God does have a purpose. We can trust Him. He's the only One who can get us home, and He's the only One who can guide us through this journey and into the next. So don't be overwhelmed by those waves. Day and night, may we pray and rest in His lovingkindness. May we remember that God does have a purpose. And therefore, we do have hope. "U.S. Marshal Jake Taylor has seen plenty of action during his years in law enforcement. But he'd rather go back to Iraq than face his next assignment: protection detail for federal judge Liz Michaels. His feelings toward the coldhearted workaholic haven't warmed in the five years since she drove her husband--and Jake's best friend--to despair . . . and possible suicide. Full of suspense and romance, Fatal Judgment launches a thrilling series featuring three siblings bound by blood and a passion for justice." To be honest, it is with embarrassment that I write this review. 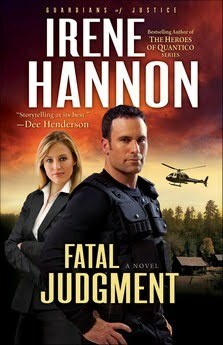 I confess to not having read all the way through Fatal Judgment, and not through any fault on the book's part. I read almost 100 pages before I fell into temptation and skipped ahead. It is a very bad habit of mind, and I do it far more often than I would like to admit. In some cases, I can just skip a little ahead at a time, and I still feel like there's surprise waiting later while being satisfied in knowing that romance is around the bend. But in this case, the whole story revolves around one specific situation, and by skipping ahead in search of more action, I ended up reading the climatic scene. And because of that, I lost my inspiration to go back and fully read the scenes leading up to that climax. And now I must make a second embarrassing confession: I'm not a huge fan of romantic suspense. Knowing this, I realize that it was not the wisest decision to request to review such a book, especially when I have so much else on my plate anyway. I will say, though, that from what I read this book is well-written and contains a lot of romantic tension. I didn't really feel like there was a lot of action, in that most of the story came from interactions between Jake and Liz while Jake was trying to keep Liz protected (ie: sequestered away from the rest of the world). However, in the parts I read leading up to that intense climax, there was enough tension and romantic conflict to keep the story flowing. I don't know if I'm qualified to say much more than that. I apologize for not having a more thorough review. Note: Because I didn't finish the book, and because I think that there are others out there who would really enjoy a good romantic suspense, I would like to pass my copy on to one of my readers. So, if you would like a chance to win this book, please say so in your comment and include your e-mail address. You must have a U.S. or Canadian mailing address. I will announce the winner on Thursday, February 3rd. Nature is still in the middle of the winter season, but here on "Seasons of Humility," a new season is coming. OK, maybe it's not that drastic! ;) But I thought I would still let you know about some new changes. I am now going to be a contributor on The Borrowed Book blog! I don't think that will really affect this blog, but I had to let you know because I'm very excited!!! I'll be over there posting about a life in the day of a hopeful author and college student (with occasional reviews!) on most Mondays, but I'll still be posting the "Mondays for the Military" posts here, as well. *The introduction post goes up on Tuesday, February 1st. * My first post will be going up on Monday, February 7th, so after stopping by here for the first day of the Season of Love Blog Party, I'd love if you'd come and say hello! Also, as you can see by the slighter shorter "Pages" list, I've deleted the "Sightseeing by the Seasons" page. I won't say that you'll never hear anything more about this feature, because I don't know what the future holds. But for now, I think I have my hands full with "Mondays for the Military," the "Contentment Reading Challenge," blog parties, regular posts, etc. I think I was trying to force a new feature that just wasn't something my heart was completely into. So unless something happens to change my mind, I'm going to just let this feature go. But don't worry! I haven't forgotten all those who entered the giveaway I had in regards to that feature! I think what I'm going to do is keep all those entries and extend them to one of my upcoming giveaways. For those of you who entered, please let me know whether you think that's fair or not. And one more thing while I'm on the topic of this blog: what would you like to see more of here? Are you craving more movie reviews? Would you like to have some book discussions like we did last year? Do you want some more themed weeks? Of course, we have the Valentine's Day blog party coming up, as well as my blogoversary in March, but I still want to hear what it is you, as readers, want. Thank you for your suppport! "Fifteen years ago, Lainey O'Toole made a split-second decision. She couldn't have known that her choice would impact so many. Beautifully written, The Search is a skillfully woven story that takes readers through unexpected twists and turns on the long country road toward truth. Fans both old and new will find themselves immersed in this heartwarming--and surprising--tale of young love, forgiveness, and coming to grips with the past." What a beautiful, colorful book! From the descriptions of the rainbow of roses and pastries, to the descriptions of the rainbow of emotions found in the human spectrum, this book enchanted me and moved me. What a vast assortment of characters! And I loved them all so much! Fifteen-year-old Bess and her grandmother made me laugh out loud on several occasions, and the first half of the book was full of funny moments among sweet settings. The story flowed effortlessly into more serious tones in the second half of the book, and I was deeply touched by the honesty with which Fisher wrote. The characters struggled. They grappled with difficult truths and decisions. And the ending left me with a bittersweet happiness. 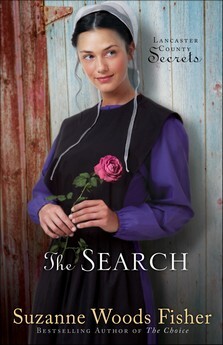 The second book in the "Lancaster Country Secrets" series, The Waiting, was good and intriguing, but this third book, The Search, satisfied me so much more. A thoroughly enjoyable read with an openness that is both tender and heart-rending, I highly recommend The Search! 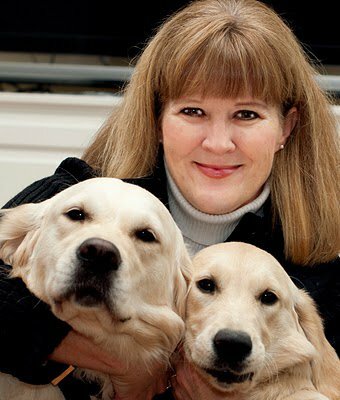 In no particular ord er, Suzanne Woods Fisher is a wife, mother, writer, lifelong student of the Bible, raiser of puppies for Guide Dogs for the Blind, a gardener and a cook...the latter two with sporadic results. First of all, thank you to everyone who played the Who Dunnit? game over a week ago! It was fun to see who your guesses were, and I hope you enjoyed seeing some pictures from my last Murder Mystery Party. Casey guessed correctly, so she won! I'm sending her an e-book that's been on her wish-list. Congratulations, Casey! Thank you again to everyone who joined in the fun! I have recently sent off interview questions to a couple of different authors regarding military books (one co-wrote a devotional, and another writes Christian fiction about the military). I'm sorry that I don't have anyone to feature today, but I thought I'd at least give you an update and remind you about the "Mondays for the Military" page. On this feature's page, you will find a list with links to past interviews, a list of possible upcoming interviews/reviews, and some links to simple ways you can show the troops you care. Also, I have enabled the comments on this page, so I would love to hear from you! I especially would appreciate hearing from you if you know of someone who you think should be featured for a "Monday for the Military" post. Anyone who is in the military, who is a veteran, who supports the military in some way, etc.--we'd love to meet them and pray for them! Thank you for your continued support and enthusiasm regarding "Mondays for the Military!" "By the word of the Lord were the heavens made; and all the host of them by the breath of his mouth. He gathereth the waters of the sea together as an heap: he layeth up the deep in storehouses. Let all the earth fear the Lord: let all the inhabitants of the world stand in awe of him. For he spake, and it was done; he commanded, and it stood fast." God is the marvelous Creator of the universe. All the colors of the sunset spilling onto the sea; the tide bringing constant waves to shatter upon the shore; the dark storm and the moonlit calm--God's creation is so beautiful! Can't you just picture it? I can't imagine the dangers of sailing out on the sea, but I also can't imagine how amazing and invigorating it must be, as well. Tyndall has captured the scenes wonderfully! I'm so glad that God gives us stories to tell and stories to read, and that He gives us the gift of creativity. How much more should we stand in awe of our Creator, God! Note: As for the Contentment Reading Challenge, I'll plan on posting mini "reviews" of each book I re-read when I do the monthly updates, so stay tuned to hear more about The Redemption! Also, be looking for a special interview with this author, MaryLu Tyndall, for the Season of Love Blog Party. Get Ready for the "Season of Love Blog Party!" As you can tell by the lovely party button Renee from Black 'n Gold Girl's Book Spot made, you're invited to a special blog party! The invitation has been posted via the new page in the sidebar, and plans are continuing to come together nicely. This is going to be a progressive blog party, which means that the party will hop from one blog to another throughout the week before Valentine's Day. It's going to be a lot of fun, with creative posts, author interviews, and giveaways. So be sure to check out the invitation and make plans to celebrate this upcoming "Season of Love" with your blogging friends! Feel free to grab the party button and put it on your blog. We'd love to have you help us spread the word! 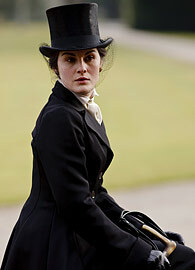 I am sorry to say that I am disappointed with the miniseries Downton Abbey currently airing on PBS Masterpiece. The quality is great, and I love the music, setting, and some of the characters. However, I personally did not enjoy some of the scenes. I'm easily bothered by things in movies, and I found myself skipping parts of various scenes in the second episode of this series. Some of them had to do with sickness and injuries, but other scenes had to do with sexuality. I suppose I'm a little saddened by the fact that online this show is said to be "TV-PG," but it showed much more than I wanted to see in a series of that rating. Due to partially skipping those scenes, I might be judging too harshly because I don't fully know all that was shown in this episode. But I didn't completely like what I did see as I skipped along. Either way, though, this show was not exactly what I had hoped for, and it left me feeling more icky than satisfied. But I won't say that I've given up PBS Masterpiece. They've put out some great shows, and I'm hoping to see more of those in the future. and Stars Collide by Janice Thompson. Oh, and I got a copy of The Rancher's Reunion by Tina Radcliffe along with some See's chocolates as prizes from Seekerville! They're all so sweet over there! And I've started re-reading my first book for the Contentment Reading Challenge: The Redemption by M.L. Tyndall. I'm hopeful that my future reading experiences will be very enjoyable, and I'm hopeful that, through God's strength, I can be productive in schoolwork, workouts, and even working on my manuscript. There is hope, and I'm clinging to it! What have you been watching and reading recently? Any disappointments? How about your hopes for the days ahead? "When a recovering romantic goes to work for a handsome ranch owner, her heart's not the only thing in danger! Gideon Westcott left his privileged life in England to make a name for himself in America's wool industry, never expecting to end up with a child. To his dismay, five-year-old Isabella hasn't uttered a word since she lost her mother. The unconventionality of the new governess concerns Gideon—and intrigues him at the same time. But he can't afford distractions. When Isabella's uncle comes to claim the girl—and her inheritance—Gideon and Adelaide must work together to protect Isabella from the man's evil schemes. Soon neither can deny their growing attraction. 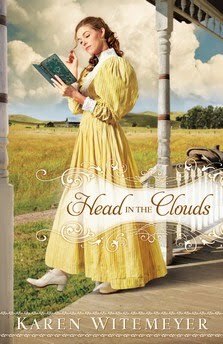 But after so many heartbreaks, will Adelaide be willing to get her head out of the clouds and put her heart on the line?" With a sweet and engaging writing style, Witemeyer swept me away through the pages of this book. I think most readers who choose to pick up this book can completely relate to Adelaide and her longing for a love story of her own. She is a fun heroine to read about, and her creative and caring heart is inspiring. I love the games and activities she does with her young charge, Isabella. Too cute! It just goes to show that imagination goes a long way in learning and growing. As far as the hero of the story, Gideon was very much the gentleman such a heroine would require. He's a gentle soul, but he's also very protective and brave. What's not to love? Together he, Adelaide, and Isabella face a lot of danger and peril, all without losing hope. This is a great love story! While I highly recommend reading Witemeyer's previous novel, A Tailor-Made Bride, this one can be read on its own. Both books are wonderful, and I eagerly await more stories from Karen Witemeyer! This week is my first week back at school. It is a new semester, with new classes and a new schedule. A new beginning. So the next few days will be a bit busy for me as I get caught up and settle into a new routine. I probably won't be posting as much for a little while as I adjust, and I probably won't be getting around to the "Sightseeing by the Seasons" giveaway this week. I'm sorry for the inconvenience, but I do appreciate your patience! This is me and my mom. I was Sheriff Sissy Wesson, and my mom was the host of Karaoke night. This is the whole gang (minus my godmother). The dummy on the chair (between the girls in the dresses) was the murdered man, and since he was supposed to have been killed in his office, we set him up in our downstairs office. The murdered man's name was Bubba, and the funny thing is that the dummy's name was Bubba long before we ever got this game! "PJ Sugar receives shocking news that she’s inherited the Kellogg family mansion. Though she has no idea why, the timing is perfect—PJ has clearly worn out her welcome at her sister’s house. Unfortunately, the mansion is in shambles, and PJ is short on cash. Rescue comes in the form of Max Smith, a mysterious handyman willing to trade his services for PJ’s investigative skills. But PJ already has a full docket with cramming for her PI license and nurturing a growing romance with her boss, Jeremy Kane. Can she take on Max’s case without dropping the ball?" This book has it all--humor, mystery, action, suspense, emotion, and yes, lots of romance! Although I haven't read the first two books in this series, I was still able to thoroughly enjoy this third installment. Mystery stories can be quite engaging, but this one was also very entertaining with its true-to-life moments of hilarity and honest struggles. I loved it! "I think that's what a fresh start is all about. Not ignoring the past, but seeing it through the eyes of God, through the eyes of grace. Knowing where we've been and where we're going. A fresh start isn't about forgetting; it's about perspective." With a hopeful message and vivid word pictures (like watching a movie! ), this book is simply wonderful! With mysterious music, a gorgeous setting, and tons of drama, the new PBS Masterpiece Classic miniseries Downton Abbey unfolds splendidly. As I watched the first episode, I went sailing back in time to the age of the Titanic--a world full of discovery and tragedy. This story is about more than heirs and inheritances. It is a story about friendships, loyalty, betrayal, and second chances. It is a story about identity. And I have become invested in the lives of numerous characters, wanting to know what it is they find on this four episode journey. To be honest, there are some characters I am wary of, and some that have secrets I really didn't want to see spotlighted. Of course, I was frustrated watching the rivalries brewing both upstairs (with the wealthy) and downstairs (with the servants). But what really bothered me in this episode was a rather explicit scene of homosexuality, involving kissing between two males. Instead of just suggesting their feelings, the scene was quite shocking and, I believe, unnecessarily upfront. I'm not sure whether this will be addressed in later episodes, but if anything it does show that homosexuality is not anything new. However, whatever the eventual point of the scene is (or will be), I think it could have been expressed without showing the kiss to the viewers. Although I did have my qualms with certain characters, I've already grown fond of others, especially John Bates and Anna. 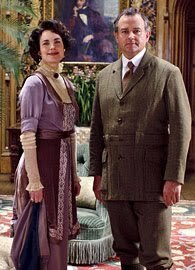 Bates (actor Brendan Coyle) was destined to be a favorite of mine after his brilliant role in North & South, and Anna's compassionate heart towards his character, along with her gentle but strong personality, won me over. I'm still a bit unsure about the Crawleys and the supposed new heir, but I'm eager to learn more about them. Overall, I have again been thrilled by the grandeur of a Masterpiece Classic miniseries, and I'm looking forward to watching the second episode, which will either bring more secrets to light or plunge me into more dark intrigue (or both!). Exercising. It's on quite a few New Year's Resolutions lists, I'm sure. It certainly was on mine! But how to go about fulfilling such a resolution? There is a gym on the campus of my school, so I can go and work out there. I could take a walk outside. And I'm sure similar options are available to you, as well. However, there are those days when it's raining (or snowing! ), and you don't want to leave your safe, warm house. Or there are days when you simply don't want to be surrounded by others at the gym. Whatever the reason, it's nice to just stay at home. But there's no reason why you still can't get in a good workout! That's why workout videos are such a great help. To be sure, some of them are goofy or strange. But find the right one, and workouts can be fun! "3 minutes of cardio moves"
"2 minutes of strength training"
"1 minute of ab exercises"
The person leading the workout (Chris Freytag) is really sweet, and the workouts are high energy but not too difficult to follow. In fact, once you do the whole workout for a while (which is about 40 minutes long, I believe), it will come second nature. I'm not a doctor, so I can't say for sure how this workout compares to others or who should or should not do it. But if you're generally healthy and are looking for a fun way to get a well-rounded workout, look no further than the 3-2-1 Workout! You can order the DVD on Amazon.com--just click HERE to take a look. Now, I'm off to go do the 3-2-1 Workout! "Belinda Bauer, in her ivory tower… In the quaint community of Poetry, Texas, Belinda spies an opportunity. 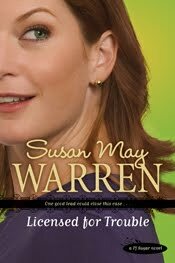 The tiny town is filled with farmers and railroad men in need of wives, so she sets herself up at as a marriage broker. There’s only one problem: Belinda doesn’t have a clue what she’s doing, and all the brides who come to Poetry marry the wrong men! One client, who has lost more than one prospective wife to Belinda’s fumbled attempts, is particularly unhappy. Is there a poetic ending in store for him—and for Belinda herself?" I'm sorry to say this book didn't quite read like pure poetry to me. Perhaps there are certain times in your life when you are more likely to be harsh on a book, and I fear this might be one of those times for me, so I apologize for any unnecessary judgments. This book is certainly lighthearted, but I confess it felt almost too much so as to be flippant in parts. I didn't actually finish the book--I read through nineteen chapters and then skimmed the rest. My heart just wasn't in it, and I felt the book was taking me too long to read. However, I should note that the book is well-written and clever. I have heard good things about this author (Janice Hannah, AKA Janice Thompson), and I would enjoy the opportunity to read more by her. This particular book just didn't quite thrill me. I thought it was interesting as I read along and caught on to the similarities between this story and Jane Austen's Emma: the matchmaker whose matches don't quite always work the way she plans, and who eventually realizes she's in love with her best friend. The matchmaking part was a bit bothersome--it felt (to me, personally) that the matches were more of a game to Belinda, and that the Lord was seen as more of a follow-up thought. I didn't feel ovely compelled to read more, as the final outcome was a bit predictable and the book felt sort of preachy and unrealistic. There were a lot of happily-ever-afters, but the tension seemed stretched out and I didn't feel like there was enough of a "journey" for me as the reader that would cause me to really rejoice with the characters in their happy endings. As I said before, this book is well-written, and this author has talent. There were some cute parts I liked in the story, such as the poetic names of the local businesses and the quirkiness of some of the secondary characters. I also liked the analogy of life being like poetry--how God often shows us just one stanza of the poem at a time. But overall, I didn't feel like I quite fit in with the folks of Poetry, Texas. I just got back from a Sunday stroll with my mom and sister on a trail that goes by the sea. Whether you live close to an ocean or not, I hope you get to spend some time outdoors today and enjoy the beauty of God's creation! Some of you may recall my attempt last year to start a new feature entitled "Sightseeing by the Seasons." I'm here to let you know that while this feature hasn't had it's time to shine yet, I haven't given up. But in order to make this feature a reality, I need your help! Right now I'm looking for some winter and spring-related businesses. Some examples would be year-round Christmas stores, rural garden shops, small town florists, lodges/restaurants, etc. Feel free to be creative in your connections to the seasons! Leave a comment or e-mail me with the name and contact information of a business that fits the criteria mentioned in the paragraph above. If you know the shop (etc.) owner personally and could get the business to e-mail me, so much the better! You can enter as many times as you like! One entry for each business I can interview and feature on my blog. If I find more than 5 businesses to feature on my blog in the coming months, I will pick 2 winners instead of just 1! The drawing closes Friday, January 21st, and the winner(s) will be announced on Saturday, January 22nd. If you talk to the business owners first, feel free to direct them to my blog--to the "Sightseeing by the Seasons" page. There is a description of the feature there. In entering this drawing, you can either e-mail me, leave a comment on the feature's page, or leave a comment here. If the business owner(s) contact me in your place, just have them let me know who told them about the feature. Thank you very much for your help! I look forward to working with you to promote the small town businesses we love and to journey across America (and maybe Canada) together! Welcome to the first month of the Contentment Reading Challenge 2011! So far, we have 12 people "officially" signed up (counting myself), but it's not too late to join! If you'd like to learn more about the challenge, feel free to visit the challenge's page HERE. Today I'd love to discuss some ideas with you for this next year, and see what books you're planning on re-reading first! Also, I'm sure we'll have to have a big party at the end of the year! Let me know which of these activities sound fun to you! And let me know if you have any suggestions for what we can do to encourage one another. As for my progress so far, I confess I've been keeping busy with new books and have not yet started re-reading any books. I am planning on going all the way and "Diving" (re-reading 20 books) this year, so I've got a lot of reading to do! ;) I'm hoping to start after I get back to school with "The Legacy of the King's Pirates" series (The Redemption, The Reliance, and The Restitution) by M.L. Tyndall. I absolutely love this author's seafaring books, and since I'm now part of her "Motley Crew" (spreading the word about her books this year), I think re-reading some of her books would be a good idea. I enjoyed them the first time around, and I can't wait to revisit these inspirational, romantic adventures! For those of you who have joined the challenge, what books are you going to re-read first? "A former marine is no match for the spunky Sam Sinclair. Bryce Stone has returned to his hometown of North Pole, Alaska, and he’s not very happy about it. “The Town Where It’s Christmas All Year Long” does not appeal to the self-admitted scrooge. What’s worse, Bryce must postpone his dream of opening a furniture shop when his aunt Olive retires and leaves him to manage the family’s cluttered Christmas boutique. When Bryce underestimates Sam, the inexperienced young woman he hires to run the store, it becomes a battle of wills, and the two soon find that they’re fighting for more than just the shop." Don't wait until next Christmas to pick up a copy of this sweet book--it's a holiday treat that should be enjoyed any time of the year! This book is like the charm bracelet from the movie The Santa Clause 2. The interesting date "Santa" finds himself with his first time around has a Christmas charm bracelet, which she say she wears "year round to keep the spirit alive." 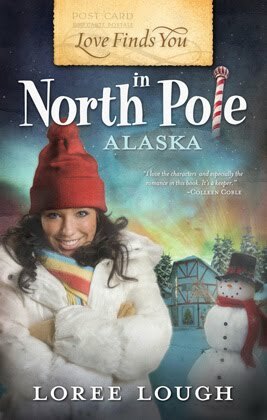 Well, this book is set in North Pole, Alaska, about which is said, "Where the Spirit of Christmas Lives Year Round." It's a wonderful place to visit through the pages of a book! I love how creative this book is! The characters are unique, from the former Marine who hates the commercialism of Christmas (and yet has to run a Christmas shop! ), to the upbeat and spunky Samantha (who has a culinary degree and yet ends up managing said Christmas shop!). The story kept me turning those pages, and while it was a really fun read, it also included some sadder and deeper moments. The ending came together a little abruptly for me, but once I finished the epilogue I was quite satisfied. With great Alaskan and Christmas imagery, great characters, and great lessons on love, patience, and understanding, this book is delightful! P.S. I just had to let you know that Summerside Press has information and cover images up for their new and upcoming "Love Finds You" books (for early to mid 2011) available on their website now! Click HERE to go and check out the latest--and then feel free to come back here and leave a comment on which one you're looking forward to the most! For me, I can't wait for Love Finds You in Prince Edward Island, Canada, but really, they all look so good! 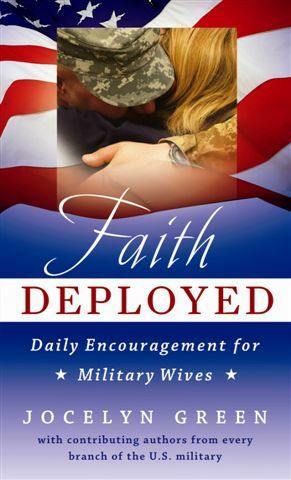 A little over a month ago I hosted Jocelyn Green, author of Faith Deployed: Daily Encouragement for Military Wives, on this blog. If you missed her visit, you can read the interview HERE. Today I'm sharing my partial review of this great devotional book. I say "partial" because I'm only about a quarter of the way through the book at this point in time. But I'd like to let you know my thoughts so far! I am not a military wife, but this wonderful devotional book is still full of great reminders for me. I have read through the first section entitled "Taking Every Thought Captive," and I am almost finished with the second section entitled "Guarding the Heart." The first section encourages the reader, through various pieces written by different military wives, to have a proper attitude--seeing blessings in solitude, joy in God's sovereignty, and a need for compassion and understanding toward others. The second section discusses more specifically the hardships of being a military wife, such as the temptations involved with being left behind, alone for long periods of time. While this book is directed more toward military wives and would surely be a great comfort and help to them, I still have been blessed by what I have read and look forward to reading more. I love the book's focus on God and others, looking beyond oneself. With heartfelt pieces, questions to ponder, and prayers to read, Faith Deployed has much to offer for any reader. In the movie, t he "Alex Rover" books are full of action, tension, fighting, near-death experiences, and overall danger. But the author (Alexandra--Alex--Rover) who writes the fiction books about the hero (Alex Rover) has multiple phobias. She doesn't leave her apartment, she uses antibacterial hand sanitizer constantly, etc. When a young girl finds herself alone on an island in the South Pacific, she calls on author Alex Rover, thinking she's asking for help from the fearless adventurer. But Alexandra Rover and Alex Rover are not the same people. In fact, they are vastly different. Throughout the movie the fictional hero is shown like he is a real person, talking with the author. He encourages her to go and be the hero the young girl (Nim) needs her to be. So she does the right thing and sets out, suffering through motion sickness in the taxi (even before the taxi starts! ), fear on the plane, being in a foreign country, getting dropped off of a boat 100 yards offshore, being terrified on a helicopter, and practically drowning. Alexandra Rover can write about adventure, but this journey she embarks on is the first time she's really lived an adventure. 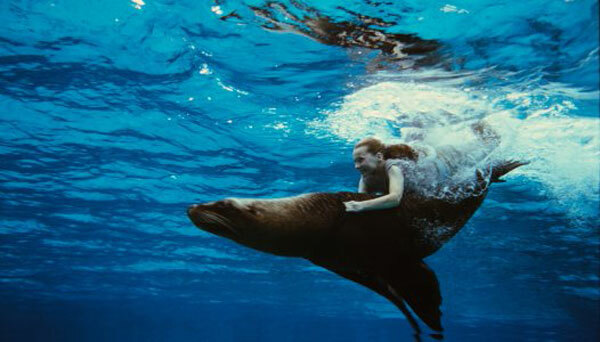 When Alexandra almost drowns, Nim is the one who saves her. In a scene right after the rescue (on the beach), Nim is disappointed with the supposed "hero" who shows up on her island, so she asks Alexandra to leave. The fictional hero (who is quite dashing, might I add, as played by Gerard Butler) shows up again and has a discussion with Alexandra. He tells her he won't be her "crutch" anymore--that she needs to go and help Nim. And then he leaves, walking straight out into the waves of the ocean and telling Alexandra to "be the hero of your own story." Now what does this have to do with me and any other hopeful authors (or published authors) out there? Well, first of all, we should remember that characters can have quite the lives (and minds!) of their own. ;) But really, it's so easy as writers to find our adventures in the pages of books, whether ones we read or ones we write. And it is good to use our imaginations, to share our passions through the written word. However, we ought to also remember to live the adventure that is the life we have been given. We need to put our faith into action in real life, as well. 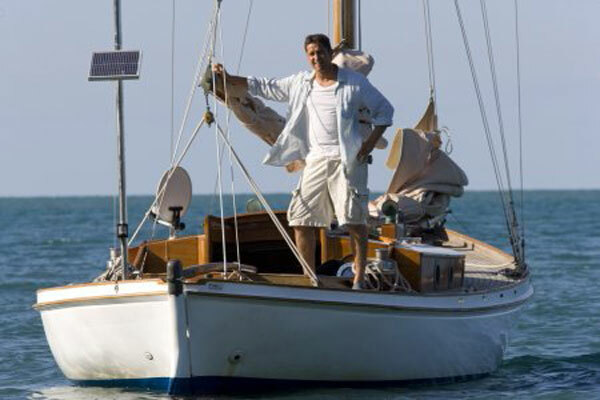 We have to step out of the boat. James 2:26 says, "For as the body without the spirit is dead, so faith without works is dead also." In Nim's Island, Alexandra Rover wrote about amazing adventures. But if she hadn't stepped outside of her apartment and taken risks to help someone else, she might have missed the most amazing adventure--her own life. Her fictional hero walked away into the sea, but she found a new home, a new purpose, and a new (real) hero in the end. I'm not saying we have to force our fictional heroes to walk the plank and leave our lives forever. We are writers, and if God has given us that gift we should never throw it away. But we shouldn't let our fictional adventures (read, watched, or written) keep us from living the real adventures God has given us in our lives. And sometimes, I think it's alright to let our characters dive beneath the waves until we have proper focus, putting God first and living for Him each day.